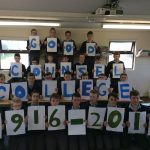 Karen O’Shea of the charity Goal visited the school on Tuesday to meet in person the senior prefects who raised 2,500 euro for the Goal Haiti appeal by holding the ‘Good Counsel’s got Talent ‘ show earlier in the year. Met by head prefect, Sam Harte, Karen got a look around the school and had a cup of tea with all the prefects as she outlined the nature of some of Goal’s work in the island left in such ruin by the huge earthquake. She also paid thanks to Mr McGinley who had raised a further 500 euro for the charity through another initiative. 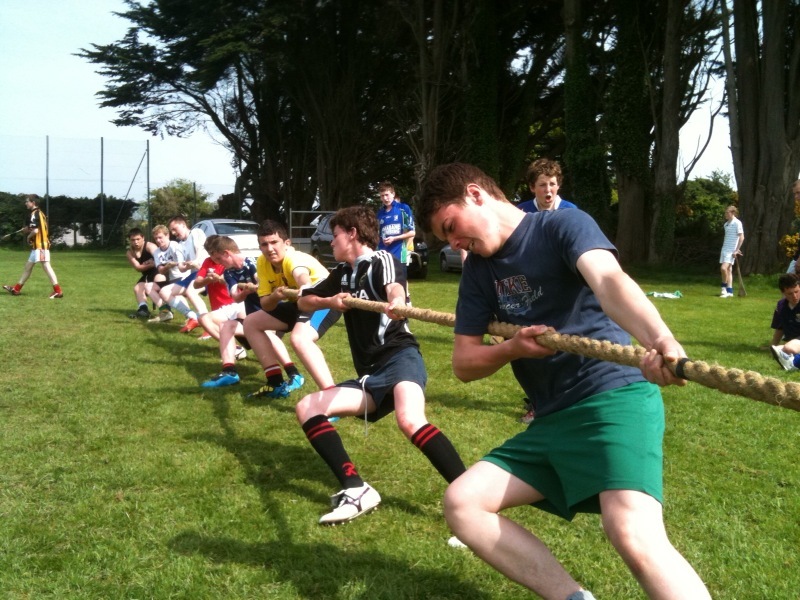 On Thursday, 1st,2nd and 5th years took part in the school sports day. on a beautiful day, the playing fields and astro turf pitches were a hive of activity as a huge range of events, both competitive and novelty, to suit all interests and abilities took place. a particular favourite was the inter class tug of war competition. With bragging rights at stake every sinew was stretched in the pursuit of glory. 2CN, winners odf the 2nd year tug of war, taking the strain. 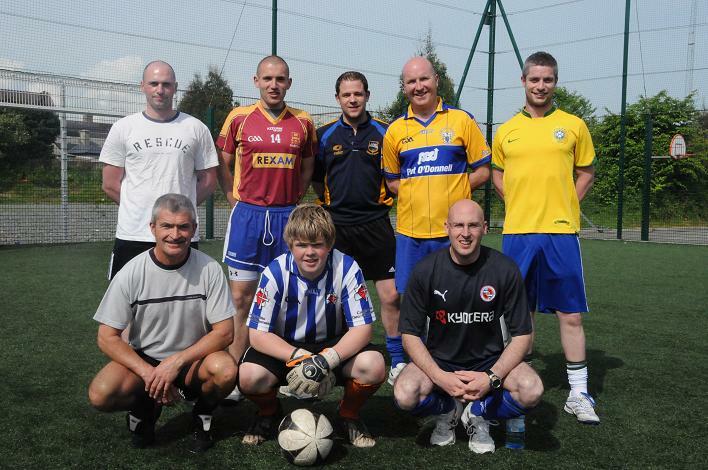 Mention must also be made of the post school soccer game which saw the teachers retain a long unbeaten record against the TY students who despite putting up an excellent performance themselves, had to give best ultimately to a superior side. Although the game was eventually decided on penalties, the teachers were always in control and when it came to the shoot out the extra quality of their finishing proved decisive. Indeed, were it not for a series of highly questionable refereeing decisions going against the teachers, this game could well have been over as a contest early in the second half as wave after wave of attack was denied reward. The contrast in styles was marked as the teachers passed and moved, committed to entertaining, attacking football while the students ‘parked the bus’ in front of their goalmouth, but given the gulf in class, this was probobly their best and only means of thwarting their more gifted opponents. In fairness, the TY students lost little in defeat and in fact surprised many by giving the teachers as significant a challenge as they did. In truth, however, it was a case of men against boys and there was only ever going to be one winner. Two 5th year students, Thomas Aylward and Jeff Barry, are this week in Lourdes as helpers with the Ferns diocesean pilgrimage. We have no doubt they will enjoy the experience and do the school proud also. On Wednesday night next we celebrate the annual Graduation mass and as ever a huge amount of work has been put into this by the R.E. teachers and many of the 6th year students themselves. One group of boys have been devoting much of their breaktime to practising the music for the evening and by all accounts it will be well worth hearing. The annual Parents’ Council 6th year students barbeque takes place next Friday. This is an annual event which is always much anticipated by the 6th year boys as they are treated to a wonderful ‘spread’ by the parents who not only fund the event but provide all the culinary manpower on the day. Lets hope the weather is as good next Friday as this.